December 9, 2010, Saitama, Japan – Morio Ono, President and CEO of Tamron Co., Ltd., a leading manufacturer of optical equipment, announced the release of yet another groundbreaking lens: the world’s most compact, lightweight lens with a 15x zoom ratio*1, featuring a 62mm filter diameter, VC (Vibration Compensation) image stabilization and Tamron’s first standing wave ultrasonic motor system for SLR lenses, PZD (Piezo Drive) *2. The 18-270mm F/3.5-6.3 Di II VC PZD (Model B008) DSLR ultra-high-power zoom lens for Canon and Nikon mounts will be released in Japan on December 20, 2010, with the development of a Sony*3 compatible mount at a later date. The 18-270mm F/3.5-6.3 Di II VC PZD (Model B008) (referred to below as 18-270mm Di II VC PZD) is an astonishingly light, compact ultra-high-power zoom lens with a filter diameter of 62mm. Weighing in at 450g, this new all-in-one zoom lens is equipped with an AF unit driven by Tamron’s new PZD (Piezo Drive)*2, an ultrasonic motor that delivers faster and quieter focusing when the autofocus is engaged. The 18-270mm Di II VC PZD, will be easy to use and highly portable – a high-power zoom that will offer the user the versatility to shoot in a variety of situations. Its wide zoom range of 18-270mm positions the lens as an all-purpose workhorse for any photographic situation. 1. The 18-270mm Di II VC PZD boasts the world’s highest zoom range at 15x magnification for a lens with its compact size and light weight*1, with the added value of Tamron’s proprietary VC (Vibration Compensation) image stabilization. At 450g, measuring 88mm in length (from mount face to the tip of the lens), and 74.4mm in diameter with a filter diameter of 62mm, it’s a compact and easy-to-carry lens. 2. Silent, high-speed autofocus in a compact lens due to the incorporation of Tamron’s new PZD (Piezo Drive) *2 autofocus technology. 3. This lens has a minimum focusing distance of 0.49m throughout the zoom range and a maximum magnification ratio of 1:3.8. Di II (Digitally integrated design): Di II lenses are for exclusive use with digital SLR cameras (with APS-C size sensors), with a suitably optimized optical design. These lenses cannot be used with digital SLR cameras with an image sensor larger than APS-C size, or 35mm film SLR cameras. (*1) For SLR camera high-zoom-ratio lenses with 15x magnification capability. Current as of December 2010. (Source: Tamron). (*2) PZD (Piezo Drive) is a standing wave ultrasonic motor system developed by Tamron. The motor is faster and quieter than DC motors when the AF drive is operated, and compared with ring type ultrasonic motors, it has an actuator that facilitates lens design and reduced size. (*3) The Sony mount is not equipped with the VC image stabilization mechanism, as the body of Sony’s digital SLR cameras has a built-in image stabilization function. Consequently, the lens with a Sony mount is referred to as the 18-270mm F/3.5-6.3 Di II PZD and does not include the VC description. Ultrasonic motors are divided into two categories depending on the principle that generates the energy to move the drive: traveling wave motors and standing wave motors. Traveling wave motors include the ring type ultrasonic motor used in the recently launched 70-300mm F/4-5.6 VC USD as well as other lenses, but this lens employs a newer technology, the PZD (Piezo Drive), which functions on the standing wave principle. A standing wave ultrasonic motor utilizes high-frequency voltage to extend and turn the piezoelectric (piezoceramic) element, thus moving the entire element in a standing wave movement. The metal tip is the contact point of the element to the rotor, and moves in an elliptic motion from the swiveling motion of the moving element, and the friction from this motion turns the rotor. Standing wave ultrasonic motors have the distinct advantage of being smaller than their traveling wave counterparts, and therefore allow a more compact SLR lens size. Tamron’s VC mechanism employs a three-coil system, whereby three driving coils activate the shake-compensating VC lens group electromagnetically via three steel balls. The VC lens elements are held in place only by contact with the steel balls, achieving smooth movement with little friction. This provides a stable viewfinder image with excellent tracking performance that eliminates the blur from handheld shots for cleaner, crisper shots. Tamron’s original VC image stabilization mechanism utilized a moving magnet system whereby a heavy magnet was positioned near the moving VC lens element. In the new VC unit the positions of the magnet and the coil are reversed, because of this the VC optical lens element is attached to the coil. The new VC mechanism employs a moving coil mechanism with a lightweight coil, and the lighter coil reduces the load on the drive system. Thus, the lighter, more compact new VC unit contributes to the lens’s overall light weight and compact size. 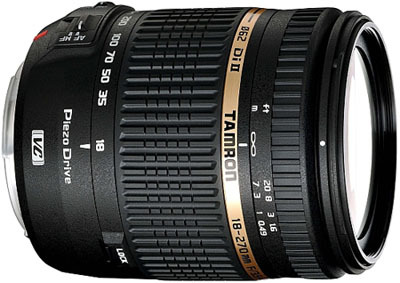 Since the introduction by Tamron of the first Nikon mount lens featuring an internal AF motor, the AF28-300mm F/3.5-6.3 XR Di VC (Model A20), all Nikon mount lenses with the internal AF motor had used the classification code “N II.” Lenses using a coupler system* without an internal AF motor were designated as “N.” As future lens introductions for Nikon will have the internal AF motor as a standard feature, Tamron has decided to simplify the designation and consolidate all Nikon mount lenses as “N,” eliminating the “N II” designation for future models. This classification code change will be effective from the 18-270mm F/3.5-6.3 Di II VC PZD (Model B008). The “N” classification lenses with coupler systems are: AF 55-200mm F/4-5.6 Di II (Model A15); AF28-300mm F/3.5-6.3 XR Di (Model A061); SP AF200-500mm F/5.6-6.3 Di (Model A08); and SP AF180mm F/3.5 Di (Model B01). *Coupler system refers to a system that uses a shaft to harness the AF motor built into the camera body to operate the lens. 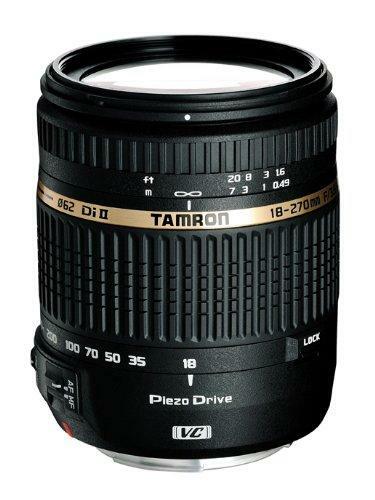 This entry was posted in Brand: Tamron and tagged DSLR, Lens, Tamron. Bookmark the permalink.